By West, do you mean toward Braddack? Heading toward E. Pittsburgh, there is a four-lane, up-hill section of road that becomes elevated and has no sidewalk or shoulder. This will take you to Main St in East Pittsburgh, by a hilly but more or less low traffic route. The same day I went through Braddock, I took a ride to the Carrie Furnace. On google maps, a green trail running from Duck Hollow to the dead-end of N. Braddocksfield Ave. under the Rankin Bridge. Is this a legitimate trail? The area around the furnace appears to be under construction and is fenced off with no trespassing signs. This reply was modified 7 months, 3 weeks ago by zzwergel. I’ve ridden the Triboro (4 lane – divided road between Braddock and E. Pittsburgh/Turtle Creek) on the weekends. Taking the lane and riding either direction , in the morning, the traffic is very light and I’ve had no issues. I’ve only ridden east in the afternoon, traffic is heavier but again I’ve had no issues. This is on the weekends mind you. During the week I wouldn’t use that route. Tri Boro Expy. goes from Penn Ave. Extension in East Pittsburgh to Thomas St. in Monroeville. It intersects Brown Ave., Thompson St., Grant St., and Monroeville Ave. before becoming freeway like through Wilmerding. I Cannot be in Braddock in the morning because I rarely wake up before 9:00 AM and live in Aspinwall. Looking downstream along Turtle Creek. Streetcar on old Braddock Ave at bottom, and the now-defunct town of Bessemer Junction at bottom center. 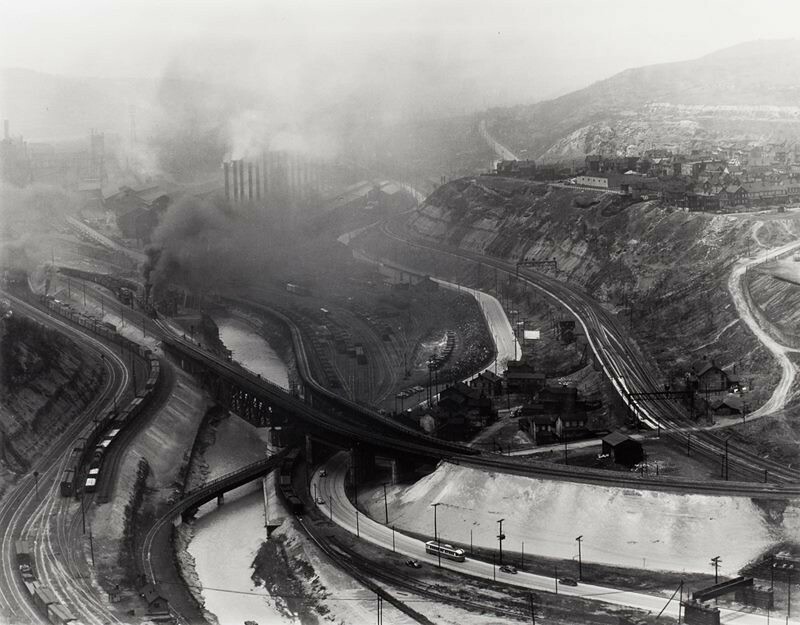 Upper left is Edgar Thomson Works in North Braddock, and the Monongahela River. Upper right is East Pittsburgh. Seeing all of that smoke makes me cringe. At least we don’t have it that bad today. I believe only one building remains from Bessemer Junction. If not the same building, it’s in the same spot and is the same size and alignment. Also cool to note the use of that narrow little road the flood gate is on, now 2138, was at one time a heavily used thoroughfare. And since freight rail and transit rail have different gauge rail widths, how did they fit both through that narrow notch, and simultaneously support bi-directional auto traffic? Good find on that old photo, Paul. I hadn’t seen that one yet. Stu, I’ve wondered the same thing myself. 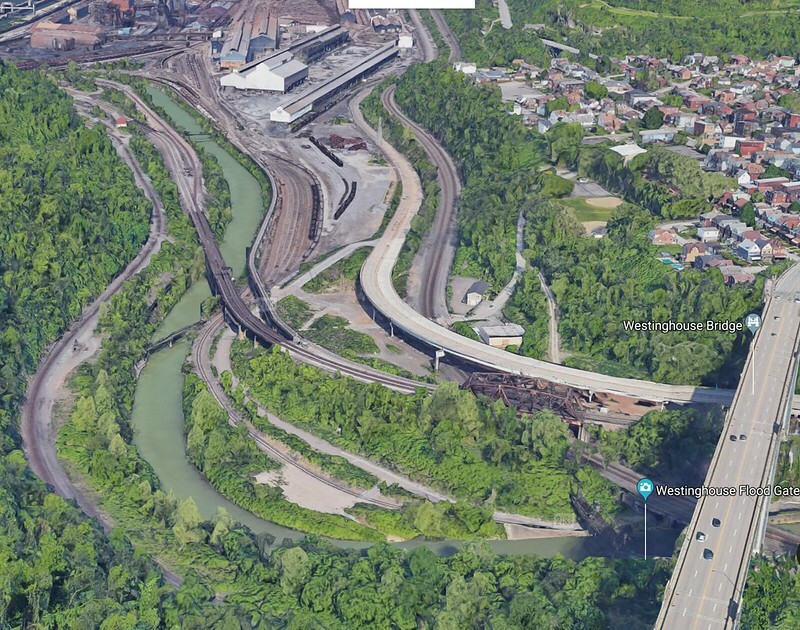 The stone arches of the PA railroad bridge would have passed over old Braddock Ave decades before the floodgate did, so that would always been a choke point. Pennsylvania Trolley gauge track was 6 inches wider than standard gauge, so a dual-gauge single track trough there might have been possible. I’m thinking it could have been a track with 3 rails, 2 at 4′ 8″ and another 6 inches outside. I haven’t seen any photos to confirm this, so it’s just a guess on my part. The carriages, with and without horses, would have to yield to the trains and trolleys when the larger railed vehicles passed through. I think that the headache this caused when automobiles became more popular would have been part of the motivation to construct the Triboro Expressway. About 20 people were in the audience, mostly from Monroeville but some from surrounding communities. We talked informally in groups after the presentation, and the ideas were flowing freely. People were welcomed to draw their ideas right on the map, which Elaine Kramer took with her back to Pashek MTR. More rounds of input and revisions are expected soon. The final bridge of phase 4 (TCKR MP 9.29) was stripped down to the metal as of a couple weeks ago. I know the original plan was to re-deck it this fall, but no exact dates have been announced. In the meantime, this one is easy to detour around via Old Wm Penn Hwy. The winning bid for the bulk of Phase 4 construction went to Plum Contracting for $1.3 million. As with the previous phase, groundbreaking is set for March. Anticipated completion is next August. Hope for a grand opening party in Export then. In somewhat quieter news, Westmoreland County was awarded a $30k grant to study the~4 mile Export to Delmont segment of the future trail. It looks like some of the land needed is already owned by the RTC or Murrsyville, some by a utility company, some by others. No word on acquisitions…but the parcel maps are here. The linear parcels of the former rail line are easy to find on the map. The deck of the final bridge on phase 4 (near the Rivertowne Brewery) is now complete. Only railings and such need done now, work on this is expected next Saturday. Some surveying work has been going on on the trail itself in anticipation of spring construction. March is still the target date for the beginning of this, though I expect they will work around the weather as need be. Comedy night was entertaining. Thousands were raised for the WHT and Five-Star trail projects. The March For Parks is scheduled for March 30th of this year. That is expected to pull in even more money for the parks and trails. Check out how the trolley, the tracks and the floodgates looked back in 1964. West of the flood gate, but looking east, toward it, if I am interpreting this correctly. The trolley car looks askew, I think, because it is merging from two-track to single-track operation to pass through that narrow bit by the flood gate. The stream appears to be on the right. Does this sound right? Yes, Stu. The standard gauge railroad line would have been somewhere behind the parking lot on the right of the photo, and merged in very close to where the flood gates are. I still don’t know for sure how any track gauge mismatch between the trolleys and the trains was handled. We went exploring back there nearly two years ago. I’d hoped that fence would have been opened by now. Anyone out there in BikePGHland who knows what (if anything) is happening next? The Trafford to Murrysville section of the WHT was in excellent condition today. There had been different instances of storm damage since last year along the trail, but there was no issue with that today because the crews have taken care of the trail to the max. They really do a fantastic job. Soon, this same ride will go into Export. It’s gonna be fun! The WHT is supposed to be extend from Murrysville to Export some time this year.Does anyone know what month?? I was planning to go out there in a few weeks,(in May), if finished.Also any more news on Turtle Creek Trail supposedly going from Waterfront to Turtle Creek?? According to the Murrysville Trail News, the plan is to have the trail complete to Export in time for Export’s Ethnic Food & Music Festival in August. I don’t know which week in August that will be.